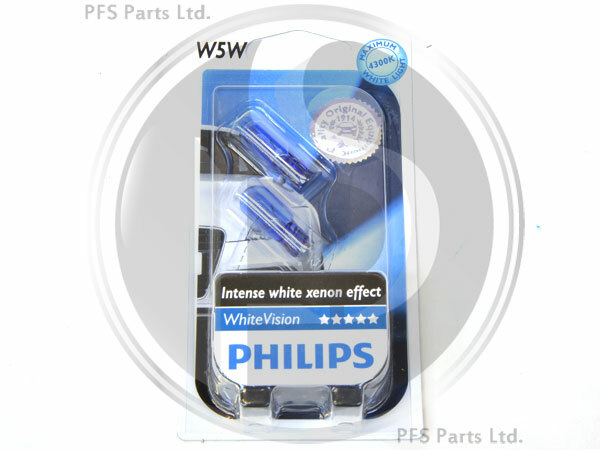 Philips White Vision 12 Volt 5 Watt Capless bulbs TWIN PACK. To Fit: Side/parking lights that use standard 12 volt 5 watt capless (501) bulbs. Philips White Vision W5W/501 bulbs are the advanced solution for side lights and parking lights and provide an intense white xenon effect. Cooler and 'whiter' light in place of standard yellow light.